Since I seem to be in a “squirrely” frame of mind these days, let’s pause for a moment to consider the great squirrel migrations. Yes, like the mighty bison, gray squirrels did indeed migrate in huge numbers, across rivers (they are strong swimmers) and through fields, apparently eating everything in their paths. The earliest records of these phenomena are in the mid-1700s. They apparently took place following “mast years” when the trees produced bumper crops of acorns and the animals reproduced accordingly, having two litters instead of one. If acorn production was low the following year, squirrels by the hundreds of thousands moved elsewhere looking for food. People shot them and even scooped them up from boats as they tried to swim across rivers. Back in those days, people ate squirrels, you know….many still do. 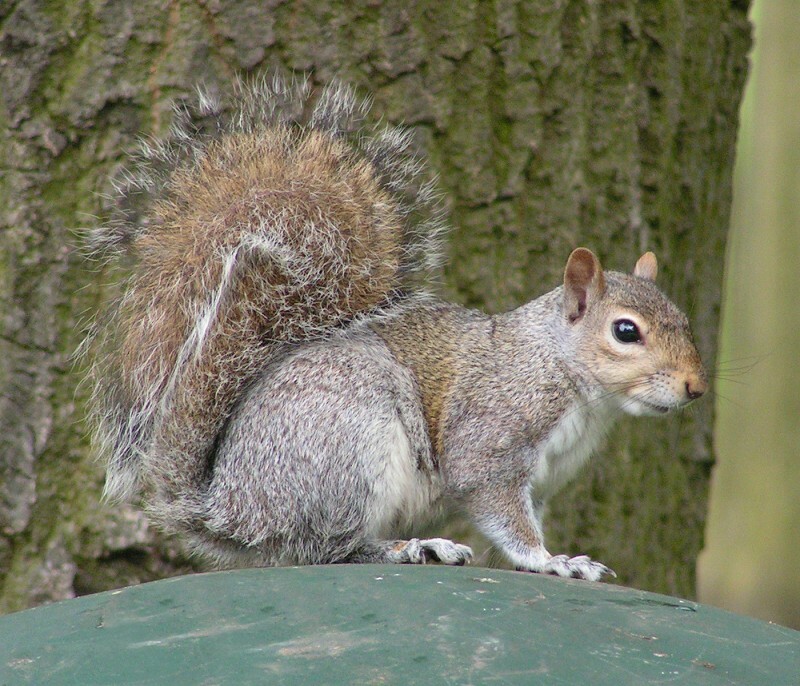 Did you know that the gray squirrel is the “official wild game animal” of Kentucky? The last recorded migration was in the the fall of 1998, but I think we experienced one this fall. There was a record low acorn production, and in September, we began seeing hundreds of squirrels dead on our roads. Were they on the move looking for food? Was this a remnant of great migrations past? I think maybe it was. I think you’re right. I was astonished by the carnage on the roads in the late summer and early autumn. So does this mean a surge in the crow and buzzard population for the coming year? though I guess the carrion didn’t coincide with the nesting season. Who knows? I guess we’ll have to wait and see about scavenger populations. But isn’t it fascinating to think that all those squirrels we were seeing were following their biological urge to migrate? Mine are plump, too – the three or four I have coming to my yard. Aren’t they lucky! They sure do, CJ. I can’t blame them. Have you ever bought a “wildlife block?” It’s a large block of compressed seeds and corn that you just set out in the yard. The squirrels and ground feeding birds love it and it lasts for weeks. You could check them out online. Interesting about your “mast year.” It just shows how much ecosystems vary from one region to the next. I bought one of those blocks once and it disappeared overnight! Those rascally racoons are the prime suspects, but I couldn’t identify even one of them in a line-up. I actually invested in some ground feeders which has helped tremendously. They can’t haul those off, thank goodness. Even though we feed the squirrels everyday, we ban them from the bird feeder with a Yankee Flipper. If you haven’t seen one, it’s a tall cylindrical feeder with a ring around the bottom which literally flips anything heavier than a bird into the yard. The first year we put it up I swear the squirrels were using it as a piece of playground equipment! 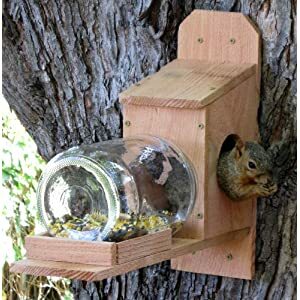 I have a different type of squirrel proof feeder, and it also works. However, being the soft touch that I am, I feed the squirrels separately – ears of squirrel corn, peanuts, etc. Me, too, dirtynailz! I’m one of those people who really enjoys the squirrels and always put little treats out for them, too. My favorite squirrel feeder is the jar feeder. We call it the seedatorium. I even feed a little crippled possum every night. I’ve seen those before in catalogs and wondered if they worked. Now if only I had a tree to attach it to…..
Nice of you to feed that possum. We used to have lots, but a couple of colder winters wiped out many of them. They’re still around but we don’t see them very often. LOL! Yep, it’s hard to keep them out of anything. I gave up. Mine love graham crackers (we buy them when they’re 10 boxes for $10)! I have to admit I can’t keep them out of the suet! You are so good to your squirrels, Kathy! I give mine peanuts and the occasional cob of squirrel corn. I hadn’t heard of the migration theory, but it sure makes sense like the snowy owls and winter finch invasions. Most years I have 3-4 squirrels at the feeders. They are allowed as cat eye candy from indoors. Occasionally after several heavy snowstorms or perhaps low mast years, not sure here, I’d get a max of 13 animals in the yard at once!! talk about eye candy!!! Regarding peanuts, I’ve heard from a DEM wildlife biologist that feeding peanuts is not good for the squirrels as it can literally make them bloat and have gas enough to make them quite sick or kill them. Remember , “peanuts” are really legumes. Real nuts however in wildlife mixes with whole corn is not as bad for them and will help many survive the winter. And speaking of feeding the birds!!! have you seen the price of bird seed??? It’s at least $3 a bag more than last year!! and that’s from a local feed store that in general is cheaper than bird stores. Beware really cheap seed that contains wheat and milo and sprayed with orange juice. These are fillers that no bird in it’s right mind will eat. That makes sense about the peanuts. I wouldn’t want to be responsible for giving squirrels gas! The woodpeckers sure like peanuts, though. In addition to the usual suet, I have a cool new peanut feeder they really go for. Maybe I’ll blog about it soon….